Carbon graphite is a semi metal that possesses both metallic and non-metallic properties, allowing it to be used in a wide variety of applications both industrial and commercial. Carbon Graphite – Weaver Industries, Inc. The carbon graphite combination of metallic and non-metallic properties results in a product that is strong and corrosion resistant. Holes are often left in the structure from the process of carbonization, but these provide an opportunity to further strengthen the product with metals, resins, inorganic salts or pure carbon in order to create a more durable product, or a more electrically conductive product. Furthermore, carbon-graphite can be heated at extreme temperatures to cause it to more closely resemble pure graphite. All grades of carbon graphite and natural graphite can be machined according to custom specifications into various shapes and objects using conventional machining and tools. 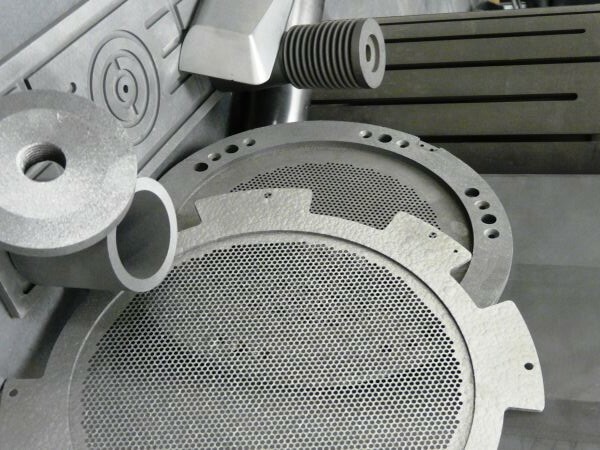 Some common applications for graphite use are in the manufacture of crucibles and molds, graphite heating elements and tubes, heat treating furnace fixtures, chemical processing equipment, molten metal extrusion, pressure casting, vertical and horizontal continuous part casting, heat shields and furnace lining and components. Graphite is an electrically conductive material and is therefore used widely as an electrode material in electrical discharge machining (EDM graphite) and commonly in arc furnaces. Powdered dry graphite is also widely used and provides an excellent dry lubricant for locks and machinery. Carbon-graphite grades which are extruded and molded may not have to be graphitized making the final material harder and stronger than pure graphite. This however, affects the properties of electrical conductivity and thermal resistance, making a carbon-graphite combination less effective in thermal and electrical applications. Another potential drawback of using graphite or carbon graphite is its streak properties. Graphite leaves a blackish grey mark when it comes into contact with another material. This property can be useful and graphite is used widely in producing lead for lead pencils. However, in machining terms, an easily marking material can cause unwanted marks on products, therefore a dust collection system or strategically planned cleaning system is necessary to think about in terms of operating procedure. Graphite is a cost-effective material that can often be used in place of pure carbon as it has many of the same properties but does not cost quite as much, and in some areas it actually outperforms carbon. Graphite is one of the only materials that is able to maintain its structure and physical properties at extremely high temperatures (as high as 5000°F). Carbon Graphite Carbon graphite usually refers to a compound mixture of petroleum coke, pitch and graphite, however it is also used to refer simply to the material of graphite that is an alloy of carbon.